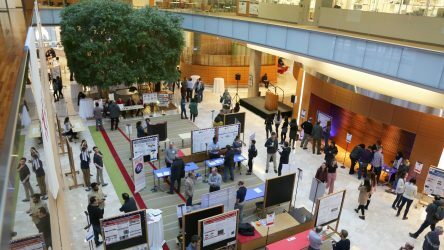 The Wisconsin Institute for Discovery and its collaborators host events focused on nucleating research at UW–Madison and beyond, creating opportunities for new connections, and engaging with the public. Most WID events take place in the Discovery Building, though it is important to note that not all Discovery Building events are affiliated with WID. For a full listing of events in the Discovery Building, please visit discovery.wisc.edu/events. SILO is a lecture series with speakers from the UW faculty, graduate students or invited researchers that discuss mathematical related topics. The seminars are organized by WID’s Optimization research group. SILO’s purpose is to provide a forum that helps connect and recruit mathematically-minded graduate students. SILO is a lunch-and-listen format, where speakers present interesting math topics while the audience eats lunch. The OoLALA Research Showcase (Celebrating Women in Origins of Life, Artificial Life, & Astrobiology) is a spring, 2019 lecture series sponsored by WISELI and WID. Dr. Kate Adamala is an assistant professor at the University of Minnesota Department of Genetics, Cell Biology, and Development. The central aim of her research is “engineer biology” to better understand how cells work, how they first evolved, and how this approach can be harnessed to help develop new tools for bioengineering. By tracking 87 million digital ads exposed to 17,000 individuals of the U.S. voting age population, Professor Young Mie Kim and her research team, Project DATA (Digital Ad Tracking & Analysis), uncovered Russian interference in the elections and assessed the likelihood of coordination between Russian and unidentifiable “suspicious” groups. The OoLALA Research Showcase (Celebrating Women in Origins of Life, Artificial Life, & Astrobiology) is a spring, 2019 lecture series sponsored by WISELI and WID. Dr. Sarah Hörst is an Assistant Professor in the Department of Earth and Planetary Sciences at Johns Hopkins University where she studies the formation and composition of planetary atmospheric hazes. The Second Annual WID Symposium features faculty lightning talks, poster sessions, networking opportunities, and more. This event is for WID residents only. The 2019 symposium will feature our annual poster competition, highlight innovative research and discovery across the Tiny Earth community, and serve as a connection hub for Tiny Earth’s student-scientists and implementing instructors. The symposium is jam-packed with opportunities for students, instructors, and other supporters to take the program to the next level. © 2019 Board of Regents of the University of Wisconsin System, University of Wisconsin—Madison. For feedback or questions, contact webmaster@wid.wisc.edu.